Probably the best invention of all time. in 1954, the year I was born, 29 million U.S. households had television sets, doubled since 1951. They became a main fixture of the home. (and still is) Like an altar to the television gods, we used to place, family pictures, flowers and display our birthday cards on top of the TV set. 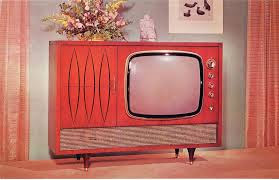 (remember when we called it a TV set?) 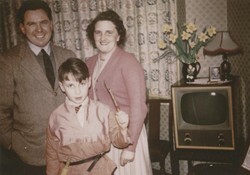 The television was a part of the family and it was included in many of our family photos. They were all so happy and smiling, to be standing next to the TV SET. Except for this couple. They look like they are being forced to stand next to it. Not happy at all. 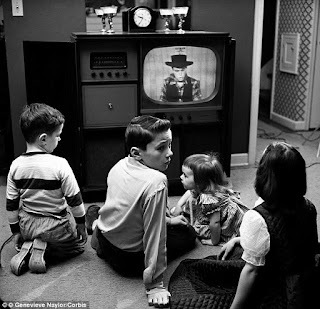 When we were not posing in front of the television, we took pictures of the family, WATCHING television. The first babysitter! Isn't that the babysitter sitting with the kids, watching TV, too? Best way to calm those little cowboys and cowgirls before bedtime. Family time in front of the TV. What can I say? We LOVED our television and still do. Television has been a big source of entertainment. I'm guilty of keeping the cable, dvd players running to keep everyone entertained. I'll be glad when my sister who has had a stroke picks up a book to read. She was not much of a tv watcher before the stroke. We don't use cable anymore - but we do have Amazon video, netflix and Hulu plus. Best invention ever! You couldn't even stand a post card on those skinny new sets. Only it doesn't "set" any more. Now it's portable - I just counted 5 different ways I could access tv just in the room I'm in. 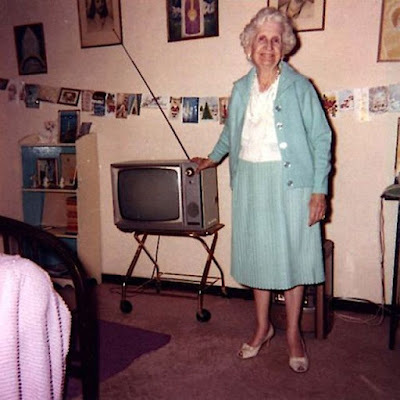 I remember growing up 2 periods of time when our TV broke and we didn't have one, both for about 6 months. 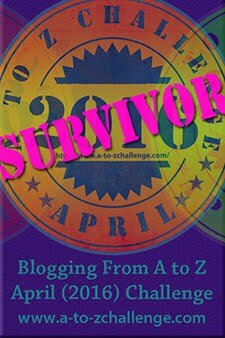 I remember how hard it was at first to find some activities to do that didn't include TV, (limited choices at the time, but still TV) but eventually we settled into a routine of radio playing, card games, crafts, etc. I like to watch TV, but I'm not glued to it like others might be. Hubby "rules" the remove here, maybe that's why it doesn't hold a particular interest for me. I do feel young children should be limited by the amount of TV watching they do per day. 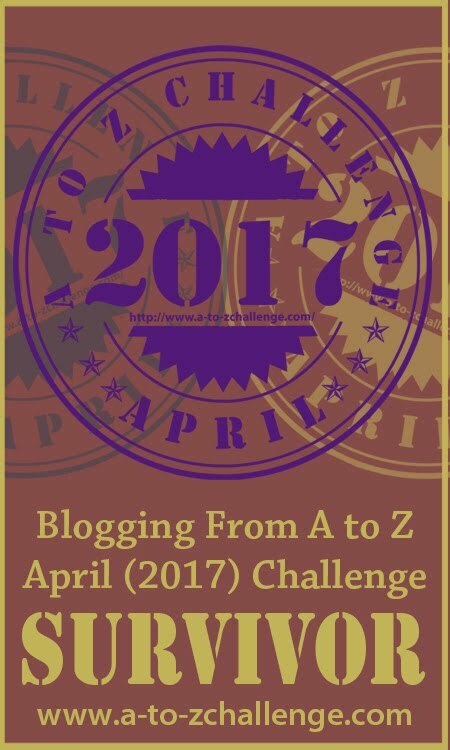 Too easy and convenient to "plop" them in front of the TV rather than playing with them or encouraging them to play on their own. Men love their TV. I watch a couple hours of netflix or Hulu in the evening. Sometimes...now that it is almost summer, it will be less. 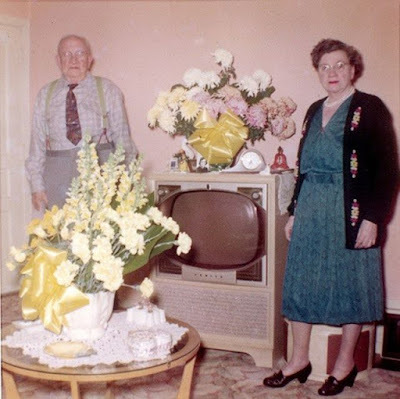 Now we have a telly in many rooms of the house not just the lounge room, I remember when my parents first got a colour tv in 1975 we first people in the street to have one and my Uncle John said dad should have waited for them to come down in price. That's funny. Every generation says that. We waited longer than most for our smart TV. and yes, it did come down in price. 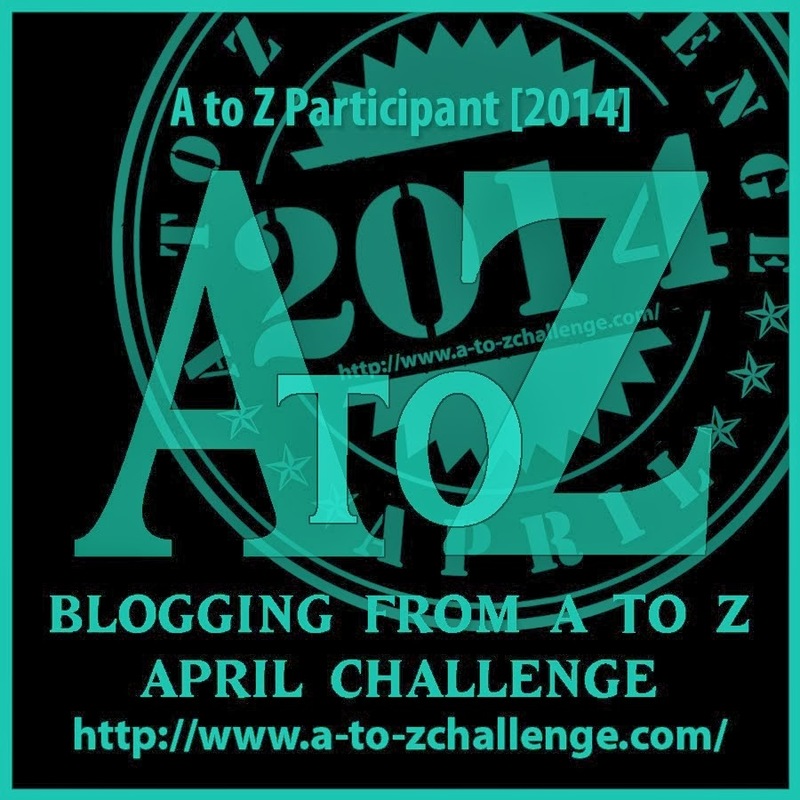 Another blogger is doing an A to Z on old TV shows. I have been reminiscing all month. We got our first TV in 1950, an Admiral that also had a radio and a phonograph. Heck, the top was so big you could serve dinner on it. It was usually all cabinet and this little itty bitty screen. Never bothered us. Oh yeah - and when color came out, we had everyone over to watch Flipper. Some of my happy moments growing up revolve around the TV. I would lay up on the side of Daddy's Lazy-boy and watch "shoot 'em ups" and football games with him. When Monday night football came out, one station ran an Elvis movie opposite the game. All the men in the family would gather at one house for the game, all the women at my sister Sarah's for Elvis. Then, when I was eleven, we were in a wreck. During the weeks Daddy was laid up, we put the TV in Parents bedroom. There were a string of old Dean Martin Matt Helm movies. We'd all pile up in bed, stay up late to watch, have popcorn or ice cream in bed. Seemed like a party! 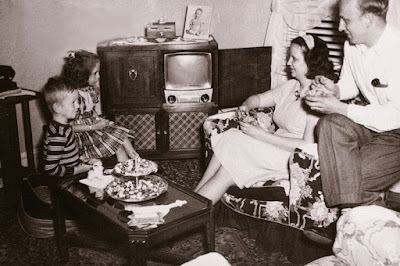 I have fond memories of watching TV as a family.